The authenticity of host '172.24.14.100 (172.24.14.100)' can't be established. ECDSA key fingerprint is ef:63:2f:70:94:33:24:53:4d:91:75:65:24:78:a4:2c. Let’s explained that just happened. Ubuntu the OS I am running on requires a gentlemen handshake between itself and any other guy (nodes) I am trying to do any ssh business with. So I have been prompted to accept the other guy’s Key. So my Ubuntu adds the other guy’s key to it knowns_hosts file so it knows that node 172.24.14.100 is a familiar face so we can do business together. You might be wondering why it didn’t do the same for node 105… well it’s because I made some mistakes so I had to verify few things for the 105 before running the show 😛 so I have already added the key for 105… basically. On the command front below is what we have passed as arguments. So with our ping, our nodes happily responded with pong through Ansible. This was easy but there is nothing to be excited about. Let’s do a little more interesting job. Let’s use 2 modules : apt and shell. using Ansible apt module we will be install unzip on both machines with one command. So assuming you have 1000 nodes , this is still done in one command. "stdout": "Reading package lists...\nBuilding dependency tree...\nReading state information...\nSuggested packages:\n zip\nThe following NEW packages will be installed:\n unzip\n0 upgraded, 1 newly installed, 0 to remove and 101 not upgraded.\nNeed to get 157 kB of archives.\nAfter this operation, 391 kB of additional disk space will be used.\nGet:1 http://archive.ubuntu.com/ubuntu/ trusty-updates/main unzip amd64 6.0-9ubuntu1.3 [157 kB]\nFetched 157 kB in 1s (123 kB/s)\nSelecting previously unselected package unzip.\n(Reading database ... 60972 files and directories currently installed. )\nPreparing to unpack .../unzip_6.0-9ubuntu1.3_amd64.deb ...\nUnpacking unzip (6.0-9ubuntu1.3) ...\nProcessing triggers for mime-support (3.54ubuntu1.1) ...\nProcessing triggers for man-db (2.6.7.1-1ubuntu1) ...\nSetting up unzip (6.0-9ubuntu1.3) ...\n"
"stdout": "Reading package lists...\nBuilding dependency tree...\nReading state information...\nSuggested packages:\n zip\nThe following NEW packages will be installed:\n unzip\n0 upgraded, 1 newly installed, 0 to remove and 101 not upgraded.\nNeed to get 157 kB of archives.\nAfter this operation, 391 kB of additional disk space will be used.\nGet:1 http://archive.ubuntu.com/ubuntu/ trusty-updates/main unzip amd64 6.0-9ubuntu1.3 [157 kB]\nFetched 157 kB in 1s (126 kB/s)\nSelecting previously unselected package unzip.\n(Reading database ... 60972 files and directories currently installed. )\nPreparing to unpack .../unzip_6.0-9ubuntu1.3_amd64.deb ...\nUnpacking unzip (6.0-9ubuntu1.3) ...\nProcessing triggers for mime-support (3.54ubuntu1.1) ...\nProcessing triggers for man-db (2.6.7.1-1ubuntu1) ...\nSetting up unzip (6.0-9ubuntu1.3) ...\n"
This will take some time to execute since it will be doing apt-get update (with the argument update_cache=true) on each of the nodes. Let’s see below values we have passed. We will skip those explained before unless it’s necessary. -a ‘pkg=unzip udpate_cache=true state=installed’: The switch a is for passing the used module’s arguments. pkg is the package we are pointing out for Ansible to action on, update_cache=true is to trigger apt-get update on the node and state is to describe what we want Ansible to do with the pointed package. Say we need to create same file inside every node. We can use the shell module and type our commands as if we are in some terminal. We have see how helpful Ansible has been. It’s not too far from what we do form terminal. How about executing multiple tasks or even more complex functionalities. To do that, we will need playbooks. It's important to mention here that playbooks and other instruction files of Ansible are mere yaml files. The above contains obviously some sub tasks and steps that might be missed when doing it manually. Let’s see how with the help of ansible we can make these tasks deterministic. Let’s start defining our playbook using apt module for the apache. 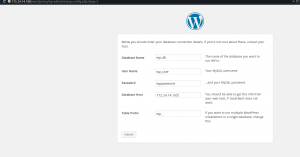 Let’s create our wordpress_on_apache.yml file in ~/ansible/playbooks folder that we created for the purpose. Please notice that the line 6 above has been highlighted for a reason. The sudo mode is activated so there is no need to pass the switch -s when calling the playbook. You might have noticed that I separated downloading and setting up of the web application. The reason is simple. 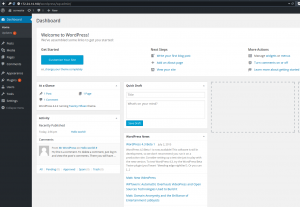 We will use a simple web deployment process which is just copy and paste but we will need to take care of the MySQL user that wordpress itself will use to connect to the database server. We need to create that database as well as prepare Ansible to contact our MySQL server. According to documentation , Ansible uses the python-mysqldb driver. The MySQL server installed by Ansible has a little special case. It installs with default root user with no password. It’s done so by design so we will need to use the mysql_user module to create the right root user. That mysql_user module uses login_user and login_password parameters for authentication. Now it uses the default root with empty passwords or read from the my.cnf file. Since I am not really comfortable putting username and password in the my.cnf file, I will have to find another solution. It’s a simple one though. I will use the mysql_user module to delete the mysql empty user and then check whether that failed or not. I have not provided login_user nor login_password so it will assume the root password has not changed. If this tasks of deleting empty user has run successfully then it means the task that sets our root with password has not been run so task for setting password for root user should then run. If the deleting of the empty user task fails then our root with password is set and different from empty string so Ansible won’t run that tasks again. prompt: "Please enter the root password"
According to the experiment we still have your skipped task on line 23, we have also ignored our mysql user task on 36 and skipped the hosts from line 39 to 41. 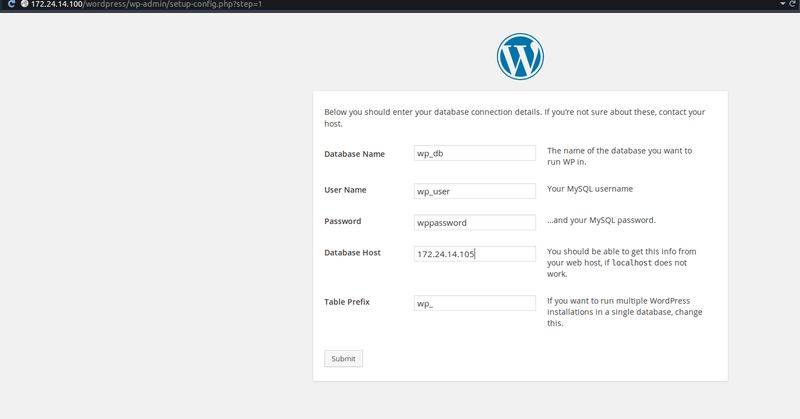 Let’s now create our wordpress user: wp_user and our wordpress database wp_db. Below shows how to run the above playbook as a new way of passing variables to the playbook has been introduced. Kindly notice that mysql_wp_password variable’s value has been passed through the extra argument switch -e.
$ ansible-playbook ~/ansible/playbooks/wordpress_on_apache.yml -u vagrant -k -e "mysql_wp_password=wppassword"
$ ansible-playbook ~/ansible/playbooks/wordpress_on_apache.yml -u vagrant -k -e "mysql_wp_password=wppassword wordpress_dest_path=/var/www/html/ wordpress_dest_path_checker=/var/www/html/wordpress"
So far, we have not actually gone to check whether whatever we have been doing are not just lies to ourselves. At this point some verifications must happen. In the browser let’s go to the IP we have defined ourselves 172.24.14.100 this should show the usual apache 2 default page. Let’s then check on the wordpress folder : 172.24.14.100/wordpress . It should show you a wordpress welcome page with option for language. When clicked on continue button, it shows information about what you need to know for the installation to be completed successfully. That’s how we know on the web front we are safe :D. Let’s also follow the wordpress installation wizard to check whether we are safe on the db front too. After clicking on submit I have seen a very nice failure message smiling at me. I have crossed checked all the parameters and they where all correct. After pondering on this for a while , I checked pinging of 172.24.14.105 from 172.24.14.100 and it replied. I then tried to connect to mysql server on 172.24.14.105 from 172.24.14.100 and it bounced. So I went to check on the network settings of mysql server installed and just saw it doesn’t allow connection from anything else but loopback address 127.0.0.1 which is also localhost. So we have identified 2 problems, first our wp_user is not allowed to connect from any host different from the server host, meanwhile the wordpress app which will use that user is on a different host: 172.24.14.100. The second issue is even if we have set that, we wouldn’t even be able to connect to the server because it doesn’t access any external connection.